What's the difference between a form and a survey? Forms can only have a single page. Surveys can have multiple pages. 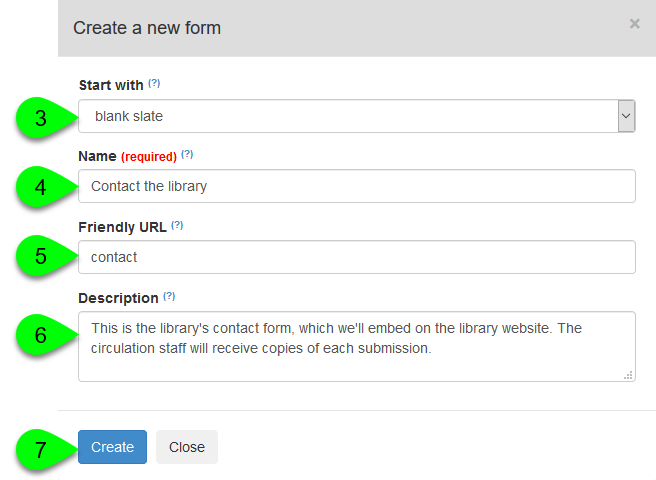 From the LibWizard dashboard, navigate to the Forms page. Select "blank slate" from the Start With dropdown. In the Name field, give your new form a name. This will serve as the page title for your form, as well. Optionally, you can give your form a friendly URL to make it easier to share and remember. Friendly URLs can contain only alphanumeric characters, dashes, and underscores -- no spaces. You also have the option of giving your form a description. This is only for internal use and does not display on the public form.